Everildo Perez puts a token into a jar in support of a proposed idea as Sammy Perez follows along at a stop for UnifiEd's Action Plan for Educational Excellence at the Highland Park Commons on Wednesday, Dec. 13, 2017, in Chattanooga, Tenn. The project committee for APEX plans to travel Hamilton County in a transformed school bus to seek public opinion about ways to solve inequities in the public school system. Issues of equity, school funding, student health and well-being, and school resources are among the biggest concerns facing Hamilton County community members, according to surveys gathered by a local education nonprofit organization. UnifiEd launched its Action Plan for Educational Excellence, or APEX, project in August with the aim to craft a policy that would ensure all Hamilton County students have the resources they need to succeed, regardless of socioeconomic status. The first step of the project was to gather community feedback, which the organization has done in the form of 2,600 surveys now being analyzed by UnifiEd's team. "Since Aug. 1, when the survey launched, over 2,600 surveys were collected ... through small group meetings ..." said Natalie Cook, UnifiEd's communications director. "Each of the 27 steering committee members hosted their own small group meetings called EdTalks ... and some principals shared the survey with their students, so we got quite a lot of youth voice with this project." These are the top 25 themes that resulted from the APEX survey, which was completed by more than 2,600 Hamilton County residents. Community members will be asked to pick their top 7 during APEX bus tour beginning Wednesday. For more information about the APEX bus tour and schedule go to www.unifi-ed.org/apex. › Equity must be at the forefront of funding decisions and policy development. › There must be funding to recruit, support and keep the best teachers. › Funds must be provided to make all school facilities safe and healthy learning spaces, and there must be a long-term plan to keep them that way. › Funding must be provided to support the end of socioeconomic and racial segregation in our schools. › Elected officials must be transparent in their decision making. › Equity must be at the forefront of decision-making processes. › Our teacher population must reflect the diversity of our students. › A plan must be developed to end socioeconomic and racial segregation in schools. › Central office administration must make and communicate decisions in a transparent way to the community to ensure accountability. › Teaching and programs must provide personalized support, especially to those with special needs and minority identities (like English-language learners and LGBTQ+ students). › Discipline policies must focus on community health and well-being within the school rather than punishment through zero-tolerance policies. › Students and teachers must have a voice in the issues that matter to them to support better relationships and engagement. › Student health and well-being must be promoted through healthy foods, physical activity, self-expression, and the arts. › Student mental and emotional health needs must be supported. › Schools must use new, creative forms of outreach to parents and communities to determine and meet their unique needs. › The community must invest in our public schools by supporting increased tax revenue. › Community members must demand the end of socioeconomic and racial segregation in our schools. › Community members must remain educated on current issues in our school system. › The community must actively hold elected officials accountable to ensure equity for all students. › Parents and community members must embrace opportunities to support schools and children. › Organizations must advocate for equity to be at the forefront of decisions made by the school system and elected officials. › Mentoring, field trips, and early childhood education initiatives must be expanded. › Opportunities for parent engagement must be fostered for student success. › Local organizations and businesses must support and provide resources to our schools. › Community organizations must actively align strategies and resources in support of equity in our schools. The preliminary results of those surveys were released this week ahead of the second stage in the APEX project: a community bus tour. The team of researchers identified 25 overall themes found in the responses, but some of the issues they identified fall outside of those themes. The survey asked participants to do two things: identify up to three equity issues that need to be addressed in Hamilton County Public Schools and list possible solutions to those issues. Equity was mentioned 1,893 times in the responses and appropriate funding was mentioned 1,471 times. "The biggest category that we've seen is big-picture issues, which is systemic issues, the top being equity," said Ashley Conrad, director of policy and research for UnifiEd. "Inequities are happening, that is the most prevalent ... the second being adequate funding." Conrad noted there was a lot of conversation around funding, including equitable funding in public schools and at schools with concentrated poverty. The overall theme of student health and well-being, was also mentioned frequently — 2,272 times — with student voice, discipline and student-teacher communication the most commonly cited issues. Respondents got as specific as start times and access to a school nurse or health care, as well. "These were often self- identified by students," Conrad said. "When we say 'student voice,' that's when often a young person had expressed they want more decision-making power in the school or they felt that their teachers weren't listening." More than one-third of respondents were 18 years old or younger, the largest majority in the data. Also, almost 63 percent were students, parents or grandparents. Only about 13.6 percent were educators, with the remaining responses coming from community members not affiliated with Hamilton County Schools. One of the most-cited issues pertaining to teachers was access to personalized professional development or additional training specific to their needs and interests. Teacher compensation was mentioned, though not just actual pay, but culture and attitude around teachers and in schools, as well. One survey response could fall under multiple categories though. "Often times these comments are hitting multiple areas at once. There are a lot of correlations, and we will be able to pull data on those correlations in the future," Conrad said. The UnifiEd team plans on using the data to analyze both the qualitative responses, as well as demographics, to inform the policy platform component of the APEX project. "We wanted to build a policy platform that was of and by the people, so that meant we needed to be ready to understand difference and the diversity of Hamilton County," said Alexa LeBoeuf, UnifiEd's director of community outreach and design. To ensure a diverse range of voices, each member of the 27-person steering committee hosted an EdTalk. Those members equally represent each of the county's nine districts, with three members coming from each district. Of the 2,600 responses, only about 1,100 gave their address and were therefore able to be tied to a district, but each district was represented. The majority, or 51.7 percent, came from three districts: District 4 (Downtown), District 5 (Brainerd) and District 6 (Lookout Valley). Since all demographic information — age, race and affiliation such as educator, parent, student — was optional, not all of the respondents noted that information, LeBoeuf said. "We always gave people the opt-out in telling us where they lived, so we have a lot of gaps in understanding people's home district," LeBoeuf said. UnifiEd also asked participants to identify the highest educational attainment of their mother and father. The majority who responded cited high school or less — 37.8 percent for mothers and 42.9 percent for fathers. 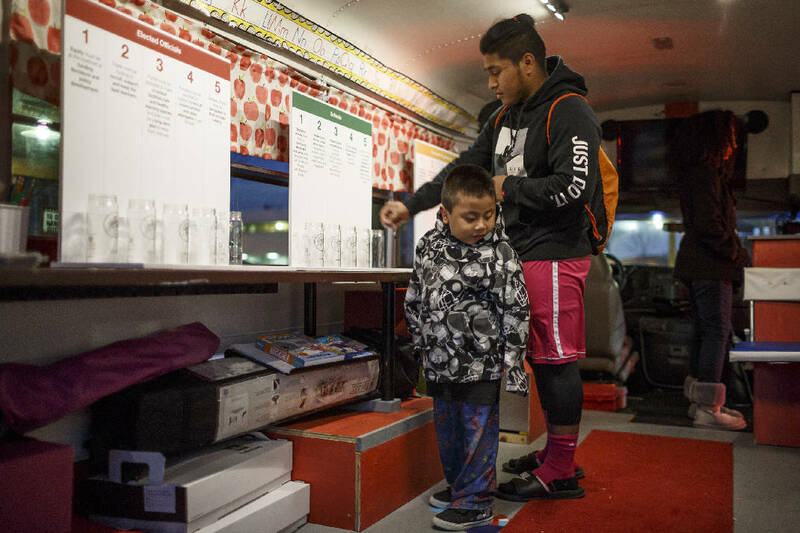 The 25 overall themes will be presented back to the community through the APEX bus tour, which launched Wednesday and will run through next week with stops at multiple schools, recreation centers and community centers. On the bus, visitors will be able to cast their vote on the themes they identify with the most. "We wanted to take that initial set of data back to communities so they could tell us what they cared about the most and extend that democratic process," LeBoeuf said. "In a way it allows us to have a more diverse constituency when we launch the bus and it allows the community to oversee our data analysis." The steering committee will recommend solutions based on the community's priorities after the bus tour, which UnifiEd will use to inform the policy platform they expect to roll out in February.